HURRAH! CONGRATULATIONS, LINDSEY VONN OF SAINT PAUL, MINNESOTA! She takes bronze in the women's downhill. I was scared to death she was going to get hurt again, but she didn't. We all held our breath through her race--and then the excruciating wait to learn whether she would finish with a medal. She did! Bronze. The gold and silver go to Italy and Norway. Oh, my ... the Shusters beat Great Britain on a concession, 10-4, after a steal of four in the eighth end! And then, minutes later, the South Koreans upset Japan a couple of sheets over, and that advances Team USA to the men's curling semifinals. Amazing. So, tomorrow, Great Britain and Switzerland play a tiebreaker. The winner will face top-seeded Sweden in one semifinal; No. 2 Canada and No. 3 Team USA are in the opposite semi. The bronze-medal game is scheduled for Friday; the gold, Saturday. Amazing. Canada, Great Britain and Sweden won the medals at Sochi 2014. Team USA finished ninth. Canada has won the last three men's curling gold medals, in fact. Team's USA's only medal ever in the sport was bronze at Turin 2006. NBC delivers a heartbreaking montage of Team USA's early Pyeongchang Wednesday/late Madisonville Tuesday heartbreaks: the shootout loss in the men's hockey quarters to the Czech Republic, some falls in the short program of women's "figs" (I'd never heard figure skating referred to as "figs" until Tom Hammond and Steve Sands this Olympics, and I really like it) and Lindsey Vonn's crying over her what was likely her last Olympics downhill. At 33, she is the oldest woman to ever medal in Olympics alpine skiing. After her race last night, she broke down talking about how her body was breaking down after so many injuries. Oh, it was sad. I love Lindsey Vonn, and I'm so glad she won that bronze. Right now, we've got Canada vs. Finland on NBC Sports Network and Sweden vs. Germany on USA Network in other men's hockey quarters. Of course, CNBC is not showing the U.S. women's curlers' key going-on-right-now game with Sweden because all of the Mr. and Mrs. Big Pants Businesspeople are up getting their early worms. Maybe I'll see if they have John Shuster, Lindsey Vonn and Johnny Weir guest-hosting Today on Channel 6. Lots of NBC love for the ski technician in the cross-country coverage all through these games. Lap 4 of six ... oh, my, Team USA is in first place ... Jessie Diggins on the course ... about to exchange to Kikkan Randall ... can hardly type ...s tomach fluttering ... GO! GO!!!!! Handoff to Diggins ... Norway 1, Sweden 2, Team USA 3 ... Switzerland 12 seconds back ... GOOOOOOO! DIGGINS BACK IN FRONT ! DIGGINS BACK IN FRONT! United States gold, Sweden silver and Norway bronze ... congratulations, Jessie Diggins, 26-year-old from Afton, Minnesota, and Kikkan Randall, 34-year-old from Salt Lake City, Utah and Anchorage, Alaska ... that was amazing ... first medal in the sport in 42 medals ... second-medal in the sport ever ... first gold ... amazing. Men's team sprint: Norway gold and France bronze. Ah, good. NBC Sports Network shows the ABC/Jim McKay footage of Bill Koch winning silver at Innsbruck 1976. That's very satisfying. Outstanding! Team USA pushes out to a big lead and then hangs on for a bronze-medal-race win over Canada in the women's 3,000-meter team pursuit. This was an interesting race. The Americans sandbagged in their semifinal earlier in the day against the Netherlands, to conserve energy for the bronze-medal race. And then they decided to push out as fast as they could against the Canadians and had to hold--seeing a lead of more than 3 seconds, more than 2, more than 1 and then less than 1 hold up for Team USA's first speed-skating medals of Pyeongchang 2018. Lexington Tom Hammond and I were dubious of the approach, but Joey Cheek--a gold, silver and bronze medalist across appearances at Salt Lake City 2002 and Turin 2006--assures us of its wisdom. He was right. Japan ended up beating the Dutch in the gold-medal final. Norway, South Korea and the Netherlands take gold, silver and bronze in the men's pursuit. I was in Greensboro, North Carolina, in March 2006 for "Joey Cheek Day" when he returned to his hometown after winning gold in the 500 meters and silver in the 1,000 meters in Italy. He wore a khaki suit, baby-blue shirt and gold-tipped cowboy boots. 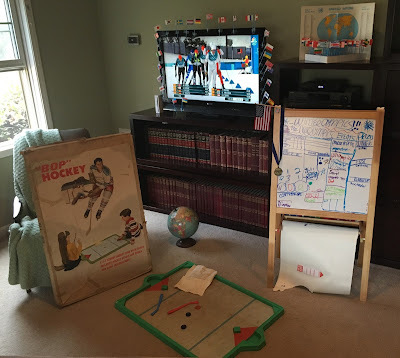 Speaking of North Carolina, I clobbered my daughter last night in the opener in the best-of-three series of "Bop" Hockey, the game pictured in the original post here and manufactured in 1968 in Tarrboro. In other action in house Olympics competition, my wife clinched the Mille Bornes gold last night. The daughter got silver; I, bronze. Four Corners Market in Greensboro. The alarm went off at 5:45, and I gave Rachel two solid, honest opportunities to stay in bed on her day off. She declined. It's wonderful being married. The train depot here is snazzy. It appears to be very, very recently renovated and maybe re-opened. The train drops you on the southeastern edge of downtown. We walked west on Washington to Elm, and here we are. It's a coffee shop/bar/pool hall/grocery. $5 for a 20-ounce black coffee for me and 16-ounce café mocha with whipped cream for her. There are several racks of groceries in the back. One of the products is Patterson's Brand Daybreak Homestyle Sausage Gravy Made with Fresh Ground Pork Sausage in an eight-ounce can for $1.29. It's packaged in Sanford, N.C. Other products: generic motion-sickness medicine, pina-colada mix and dog food. One of the great things about Rachel is that she's such an avid little researcher. She's already found a civil-rights museum, public library and vegetarian restaurant for us to visit. Pretty entertaining downtown tabloid: The Rhinoceros Times. One of the staff writers, Scott Yost, used a column about the ACC men's basketball tournament to talk about the feelings of belonging and being unworthy of good things. He also took a lot of pictures of the Florida State cheerleaders. Points of interest on Elm: Coe Grocery, with all sorts of bite-sized candies; Kindley's Used Office Furniture, with vertical ledger stands and ancient ITT phones, and the façade of Fordham Drug Store (prescriptions, sundries and soda fountain). ... At the African American Atelier in the Greensboro Cultural Center, Sandy says that downtown has been restoring itself. "When I was a kid, I never came down here." She moved to Greensboro from New York at 14. "This is where I decided was home. This is where I want to be. I'm 40 now, and I've got a son, and I knew I wanted to raise him in the South." Lots of student art in the corridor of the Greensboro Cultural Center, and I like it almost as much as or maybe at least as much as the stuff in the galleries, which I also like. There are plenty of posters congratulating Joey Cheek. So we moved on to the local historical museum. Neat stuff on Dolly Madison, local baseball teams, the Jewish community here and especially the lunch-counter sit-ins. That's a tremendous display with four restored stools from the Woolworth's and various photographs and newspaper articles. Here's something new I learned about that time: On their way to the Woolworth's on Feb. 1, 1960, the four guys from North Carolina A&T stopped by a clothing store on East Market Street operated by a white opponent of segregation, Ralph Johns. Wonder if that guy's still around? On to lunch: 40 Bistro. It's the restaurant in the downtown Marriott. The lunch soup, salad and sandwich (!) bar was only $4 a head. Rachel had a cup of soup, even though it was vegetable beef. She's pretty sure it was created from roast left over from the previous evening. I, meanwhile, assembled a winning tomato, lettuce, banana pepper and four cheese sandwich with mayonnaise on sliced sourdough. We also both had salads. I also had a bag of Sun Chips, which we were surprised to learn are almost absent of bad fats. "And they have 8 percent of your Vitamin E for the day," Rachel said. "That's pretty good for a bag of chips." We also agreed that, while we don't want to start stocking it in our own refrigerator, cottage cheese is a welcome sight on salad bars. I was able to get a wi-fi link in the business center at the Marriott and was relieved to find no unpleasant e-mail. Rachel explored the lobby. I called Mom and Matthew. Now here we are - back out on the street. The Dolce Aroma Coffee Bar at 233 Elm Street is a fine place to take a load off: $1.50 for a 16-ounce cup of coffee, unobjectionable music ("Unforgettable" by Nat King Cole at the moment), pleasant burnt-orange walls, comfortable chairs, varnished hardwood floors, plenty of natural light. Rach just found a recipe for ice-cream pie in a copy of Southern Living she got for free at a yard sale. You can't do it all, and we haven't. We've lost the last two hours exploring Greensboro's fantastic downtown library. Rachel has been reading about the history of Kentucky county boundaries, and I've been reading about Greensboro, Mercury Morris and L.C. Greenwood. And now we're nearing the Cary station - almost home. We just rolled past the soccer fields on the west side of town. It was pretty fun to see them illuminated and full. They're playing soccer, not hard-ball baseball, and we're riding the train. It's the new and old at once. Rachel's reading Leaving Home, a Collection of Lake Wobegon Stories, by Garrison Keilor. (She bought it at an American Cancer Society fund-raiser used-book sale we stumbled upon shortly after lunch. It cost $1. The book I selected cost only 25 cents: The North Dakota Joke Book, "By Montana's Own Mike Dalton." "The there was the North Dakotan football player who heard he was going to be a first round draft choice. He fled to Canada." I've been doing a little tidy-up work. I took a picture. I ate some cookies. "Four minutes out 'til Cary," just said the conductor. It's a bit sad, this trip coming to an end, though it's always a little exhilarating to feel newly accomplished, newly less daunted. I'm glad we went. Glad Rachel didn't want to sleep in. Oh, my gosh, the tagline of CNBC is "Get Yours." Are you kidding me?